The beauty of the Devon landscape, moorland and coast has attracted artists to the county over the last two centuries. Equally, the wonderful Cornish light and Cornish coastal scenery has been a great source of inspiration for artists. 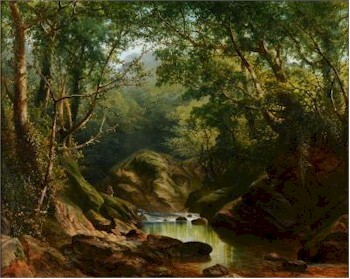 'On The Erme near Ivybridge' by William Williams of Plymouth, which realised £950 at auction. (FS17/454). The art that has been created in and around the Cornish port of Newlyn, both past and present, is well-known with Alexander Stanhope Forbes, SJ Lamorna Birch and Harold Harvey among the leading lights. William Widgery (1822-1893) - A Wooded River Landscape with Figures (FS17/453) offered in our Three Day Fine Art Sale starting on 29th January 2013 at our salerooms in Exeter, Devon and attained £380. Bearnes Hampton & Littlewood have for many years been privileged to be involved in valuation work and advice for the art collection at Dartington Hall. Their magnificent core collection is a small part of a much larger collection assembled by Leonard and Dorothy Elmhirst who are generally accepted as being the most significant private patrons of architecture, the Arts and education of their generation in England. 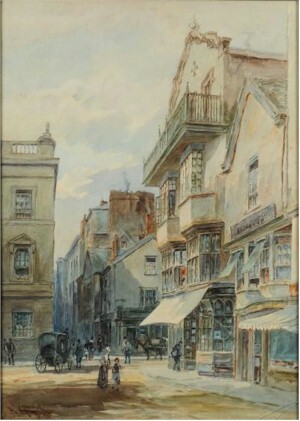 Alfred Leyman (1856-1933) - Cathedral Close, Exeter (FS17/436), which realised £1,500 at auction. In the 1930s and 40s, the Dartington Hall estate in the west country was home to many influential artists including Cecil and Elizabeth Collins and Mark Tobey. Artists with west country roots represented in the Dartington Collection include Ben Nicholson, Bernard Leach, Alfred Wallis, Christopher Wood and Winifred Nicholson. Bearnes Hampton & Littlewood continue to sell works by these artists with close connections to the west country along with work by Terry Frost, Paul Feiler and the Newlyn and St Ives School painters. 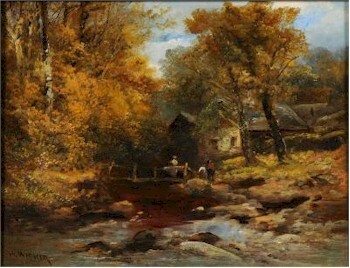 In a more traditional style, the popular west country watercolours by familiar names like Frederick John Widgery and his father William Widgery, Alfred Leyman, William Williams of Plymouth, William Traies, Charles E Brittan, Tom Rowden, RD Sherrin and Shapland together with the large school of Dartmoor artists like Rubens Southey, WH Dyer and Douglas Houzen Pinder regularly come to our rooms and many are offered in our weekly pictures sales, generally in the price range of £100-£500.